Altrincham FC's ground is situated on the corner of Moss Lane and Golf Road, about a ten minute walk from Altrincham town centre. As the town-centre end of Moss Lane is one-way, leading away from the ground, there is no vehicular access to the ground from the town centre from the junction with Stamford New Road. Please follow the directions below to get to the ground. Details of routes to Altrincham FC, by road or public transport, are given below. Alternatively, Red Planet offers a useful interactive means of selecting your route to the Football Club. Please also note that there is no public parking at the ground itself. However, from January 2015 Altrincham Football Club have had an agreement with Aecom on Moss Lane (formerly Riley's Snooker Hall) over the use of their car park. As a result, Altrincham Football club has use of Aecom's car park on Tuesday nights and Saturday afternoons when a game is being played at the J. Davidson Stadium. We urge supporters to use the car park and thus alleviate the parking problems around the ground and surrounding roads. The car park will be open on saturdays from 10.30am and will be locked at 7pm and on Tuesdays will be open until 11pm. There is no charge for users of the car park. Altrincham Interchange, in the town centre, is served by buses from Manchester Piccadilly bus station; Arriva service 263, and Stagecoach's X41, (the latter is a much slower and less regular service). The Transport for Greater Manchester bus timetable library provides the times of these services. The Metrolink tram system terminates at Altrincham and be caught in Manchester City centre as well as at Manchester Piccadilly and Victoria stations. Be sure to get a tram whose destination is Altrincham as several other routes operate to other towns. Tickets for Metrolink have to be bought from machines prior to making your journey. The bus is cheaper. Buses from Piccadilly typically take 45 minutes to Altrincham but allow longer in the rush hour. Metrolink takes about 30 minutes and is unpredictable as there is no published timetable. Notionally trams operate every 12 minutes and every six in peak hours. 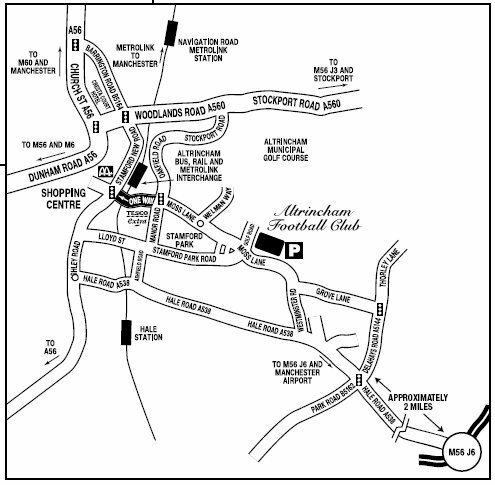 Altrincham FC is about 10-12 minutes walk from Altrincham Interchange. The Interchange is a terminus for buses, trains and the Metrolink tram system. You can exit the railway/tram station on two sides. The town centre side has a forecourt in which is located a distinctive clock tower; the rear station exit is into a car park. Exiting from town centre side: With the clock tower in front of you and the station behind you, turn left into Stamford New Road (the Railway Hotel is on the far side) and take the first left (Moss Lane). Go over the railway bridge and pass a large Tesco hypermarket to your right. At the road junction at Tesco's (traffic-light controlled) go straight on up Moss Lane. Walk for about 8 minutes, passing a park on your right and crossing a mini-roundabout, till you reach the ground on your left. Exiting from rear of the rail/tram station: If you have arrived by tram you can use the station footbridge to arrive at the rear exit. From here go forward 100 yards or so and turn right onto Oakfield Road. At the first set of traffic lights, turn left onto Moss Lane. Walk for about 8 minutes, passing a park on your right and crossing a mini-roundabout, till you reach the ground on your left. Directly opposite the ground are shops which include a chip shop, bakers and two convenience stores/newsagents. 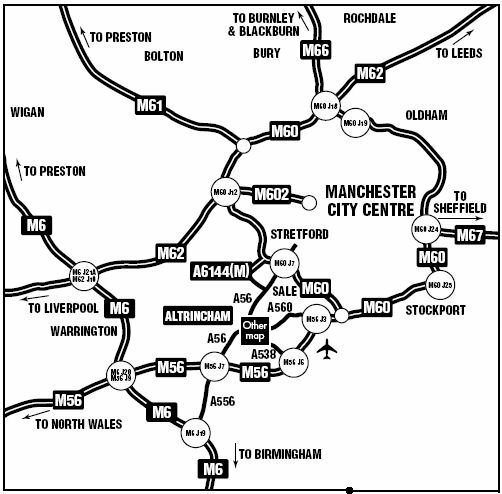 Leave M6 motorway at junction 19 (Manchester and Airport sign). Join A556 and follow Airport signs to M56. Do NOT take the M56 but carry straight on at roundabout on A56. At first traffic lights (1 mile) turn right for Bowdon/Hale (B5161). Carry on for 1 mile, passing The Quality Hotel on the right. Go through the traffic lights, then right at the mini roundabout into Hale Road (avoiding town centre). Carry on for approximately 1 mile, turning left into Westminster Road (opposite cemetery entrance). Carry straight on for approximately 3/4 mile into Moss Lane, the football ground is on the right. Leave M6 motorway at junction 20 to join M56. Leave M56 at junction 7 and at roundabout take A56 for Altrincham. At first traffic lights (1 mile) turn right for Bowdon/Hale (B5161). Carry on for 1 mile, passing The Quality Hotel on the right. Go through the traffic lights, then right at the mini roundabout into Hale Road (avoiding town centre). Carry on for approximately 1 mile, turning left into Westminster Road (opposite cemetery entrance). Carry straight on for approximately 3/4 mile into Moss Lane, the football ground is on the right. At junction 18 of the M62 the motorway changes its name to the M60. After passing Birch Service Station get into the inside lane. Follow the sign which reads M60 (East and South), Manchester and Airport. Follow the left filter lane to join the M60 motorway travelling in a clockwise direction. Continue to follow signs for Manchester Airport and at junction 3 of the M60 getinto the inside two lanes and leave the M60 to join the M56. At junction 2 of the M56 do not follow the Altrincham sign but remain on the M56 following signs for the Airport. Do not leave the M56 at Manchester Airport but continue until junction 6. Leave the M56 at junction 6 signposted A538 Wilmslow, Hale, Macclesfield. At the end of the slip road turn left at the traffic lights signposted Hale, Altrincham A538. Go straight across at the next roundabout. After approximately 2 miles approach a set of traffic lights – carry straight on and take the third turning on the right into Westminster Road. Carry straight on for approximately 3/4 mile into Moss Lane, the football ground is on the right. Leave the M62 at Junction 10 and join the M6 travelling in a southerly direction. Then follow the directions as from the North as above.